Cape Town - SA Revenue Service Commissioner Tom Moyane insisted that while businessman Patrick Monyeki was his friend, he was not aware that the businessman was doing any direct business with SARS through the revenue service’s debt solutions provider New Integrated Credit Solutions (NICS). The company and Monyeki have come under the spotlight following reports in the Daily Maverick that the company paid R600 000 into the bank account of SARS chief officer for business and individual tax, Jonas Makwakwa. NICS paid Mahube Payment Solutions, a company linked to Monyeki, according to a Financial Intelligence Centre report. The company has also alleged to have been part of "suspicious transactions" involving these businesses and Makwakwa's bank account. 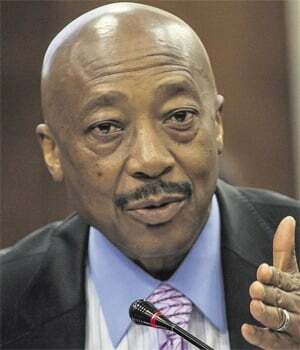 Moyane told the committee that Makwakwa agreed that the committee would have access to reports into SARS as well as an internal disciplinary report into Makwakwa who was suspended parallel to investigations into him and Kelly-Ann Elskie. Members of Parliament’s Standing Committee on Finance demanded answers from Moyane as reports drew links between Monyeki, NICS and Makwakwa, claiming that Makwakwa had links to the business that is now assisting SARS with debt collection. Moyane acknowledged that he knew Monyeki as a friend, but did not know the intimate details of Monyeki’s interests as a businessman. He said he got no indication that Monyeki had been involved in the function of assisting SARS with debt collection through any service provider business. “I don’t know the links between Monyeki and NICS. All I can say is that I know him. NICS has done work on debt collection for SARS since 2004. The procurement processes at SARS are clear. I don’t get involved or informed which companies get appointed,” said Moyane. Moyane distanced himself from reports that a conflict of interest must be considered for Makwakwa, saying that Makwakwa had told him prior that he had nothing to do with NICS and that the individual with the same last name said to be involved in the business was not known to Makwakwa. “I hear these reports for the first time. If it is the case then Makwakwa must come clean to me that he has shares or knows someone who has shares at NICS. He did declared that he has no interests and does not know the Onica Makwakwa who is listed as being linked to the company,” he said. Moyane told the committee that as commissioner he is not directly informed or involved in the details of the revenue service’s procurement processes, but said that to his knowledge Monyeki had not leveraged his relationship with the tax commissioner to get into business with SARS. “There is no involvement by Monyeki in NICS that directly affected procurement, and if such exists then it was according to our procurement guidelines. No relationship. Monyeki is a friend, but I don’t know of any links to NICS. All I know is that he is a business man within his own rights,” he said.